Fair point from mum, I guess. 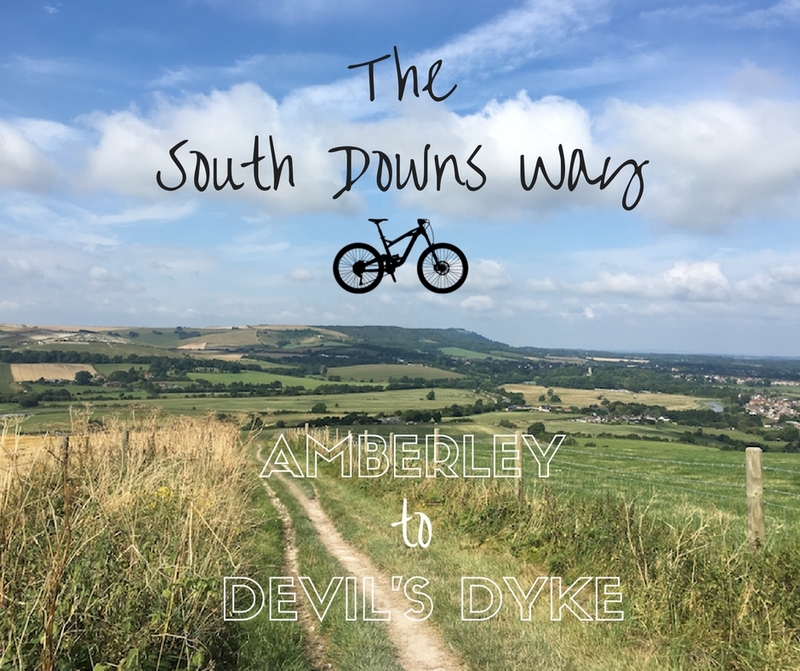 The final leg of our South Downs Way was a not-too-painful 18 miles from Amberley to Devil’s Dyke, where we arrived to a welcome of blue skies and beautiful sunshine, promptly sitting down to stuff our faces with steak and fish finger sandwiches. 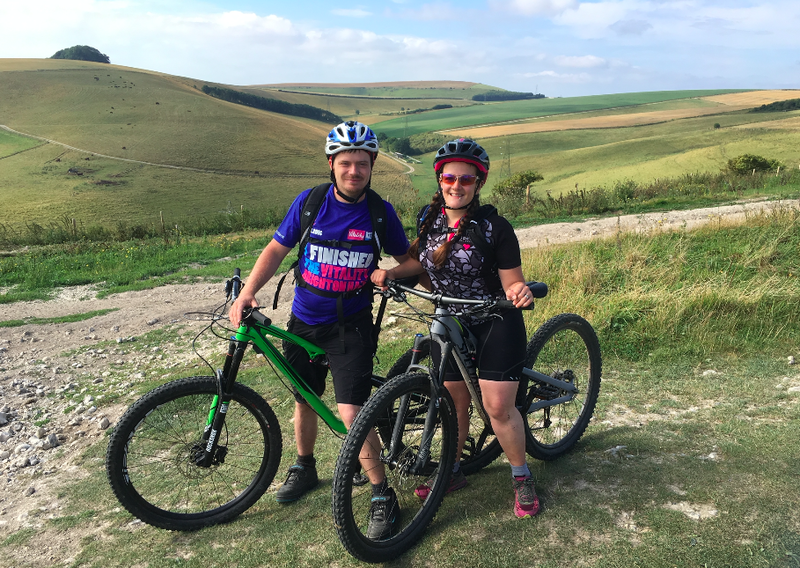 Part 2: Petersfield to Amberley (would’ve been Brighton to Amberley then onwards to Petersfield but we didn’t fancy a 20mph headwind thank you very much). The Amberley to Devil’s Dyke leg started with a steady climb on tarmac out of the village, (obvs), and then a really steep hill to get on top of the Downs once we were in the fields (Amberley Mount). 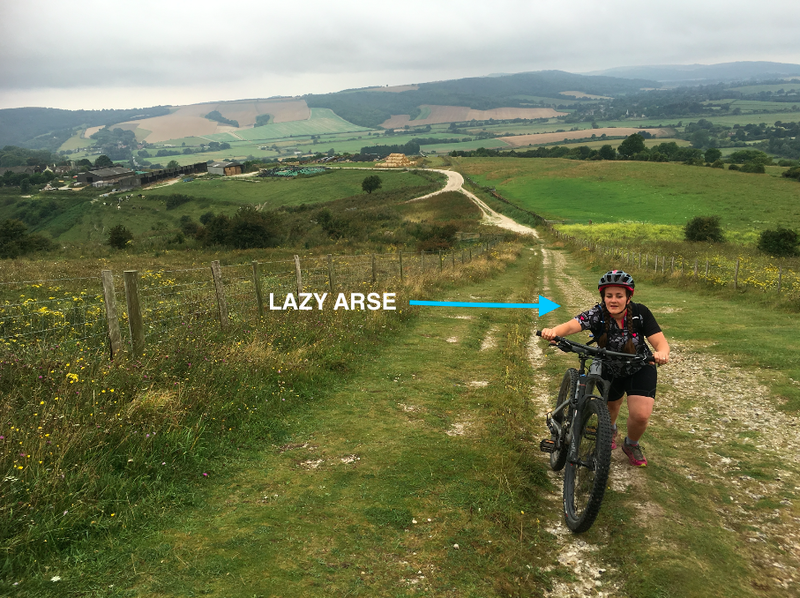 I’m not gonna lie – with a belly full of breakfast and tired legs from the previous two days of hills, we basically couldn’t be arsed with that straight off so got off and pushed. That totals two hills that beat us during the entire trip – the formidable Beacon Hill on the Petersfield to Amberley leg, and this one because we were being lazy. 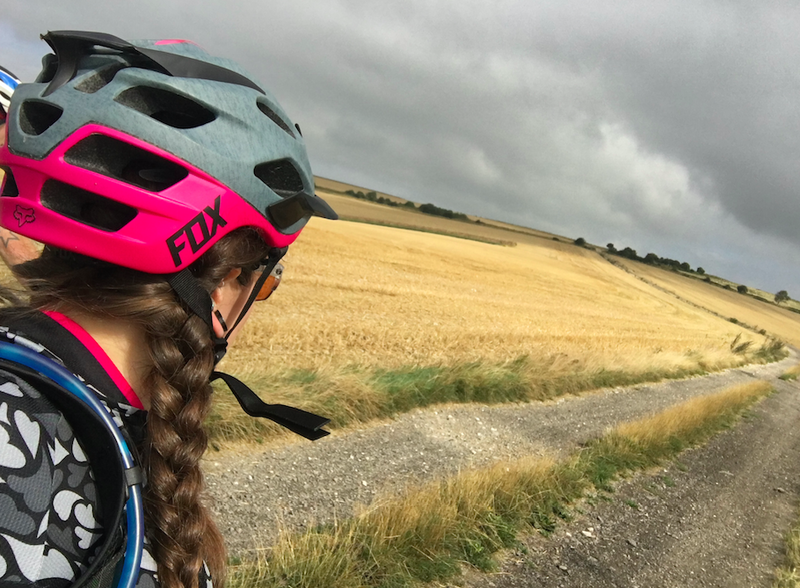 Once we got up onto the Downs it was a lovely rolling ride, following paths, through open fields and on tracks, with some challenging, steep chalky climbs and some wicked fast descents. After my collarbone and wrist break, I’m still being careful / a bit scared on the downs compared to how I usually ride, because I’m seeing everything as a potential fall hazard now rather than something to just roll over nice and fast. 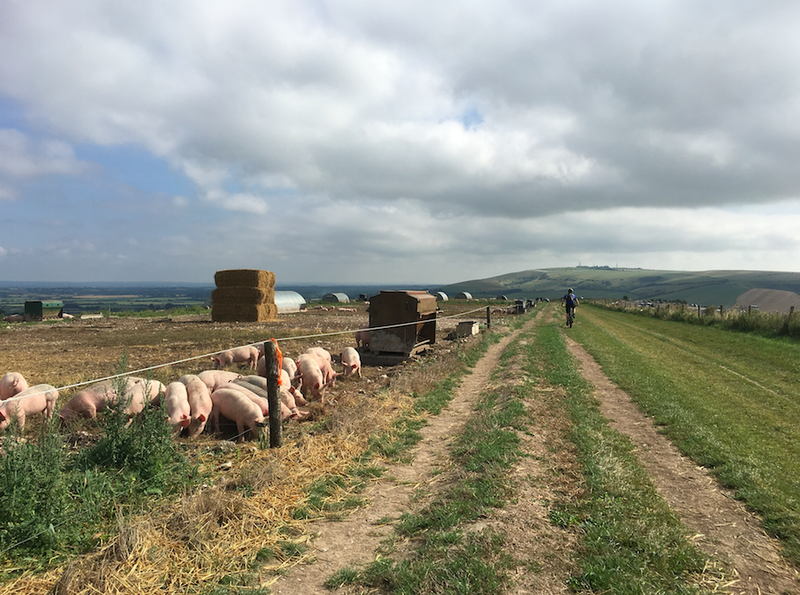 We passed a pig farm and even bumped into some Brighton Triathlon Race Series buddies (BTRS) along the way to give you guys a welcome break from my crap selfies to snap a photo of both of us together! Just after the pig farm we were treated to a great fast descent before crossing the main road for a beasty climb up Truleigh Hill and heading on towards the Dyke. A smattering of paragliders drifting across the blue sky made this homecoming all the more special after such an epic weekend of cycling, and of course I stopped to take far too many photos, again. We got to the pub just before lunchtime and sat down with a beer to relish in our achievement. Just look at it. THIS is why we do it. I know we didn’t ride the whole thing, and we did it in a bit of a faffy, expensive, ‘fair weather cyclist’ kind of way, changing our route and catching a train to avoid the headwind; and we probably refuelled a bit too much for the energy burned… but who cares. What an adventure! Where else can you be as free as when you’re on a bike? I’m so lucky that Chris loves cycling as much as I do – it’s brilliant to be able to do this together. Every holiday we have, we take the bikes, or end up hiring some. All I want to do at the moment is ride my bike – probably making up for my injury and few forced months of rest out of the saddle. For the non-cyclists who read my blog, please bear with me while I continue this love affair, it’ll fizzle out eventually, I’m sure. Or maybe I’ll find a new bit on the side – I’m looking to run Brighton Marathon again, this time with hubs – it’ll be his first ever marathon! Do you like cycling? What are you really into at the moment?